Happy Monday! I hope everyone had a fabulous weekend. For those of you on the East Coast, I hope you all had minimal damage from the storm and stayed safe. 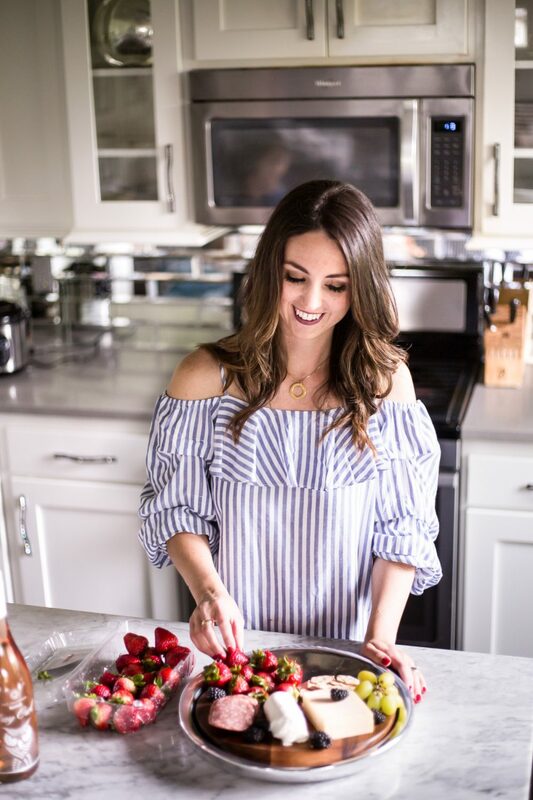 Today, I have a really simple and sweet Holiday Gift Idea for you. 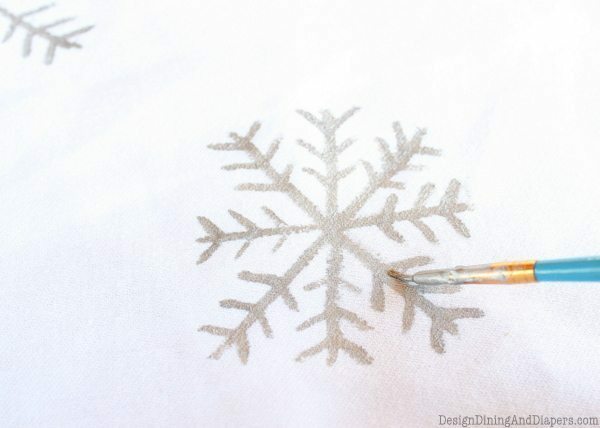 Using white cotton fabric, Jacquard Lumiere paints and a basic sewing machine stitch, I made these chic Hand Painted Christmas Dish Towels. As always, I’m sporting the neutral colors. But these could easily be done in any color combination. I think they would make a perfect homemade gift for the Holidays. Let’s face it, we all could use some extra dish towels! Jacquard Products were nice enough to send me a box full of fun paints to try out and I’ve been having a blast experimenting and trying new mediums. 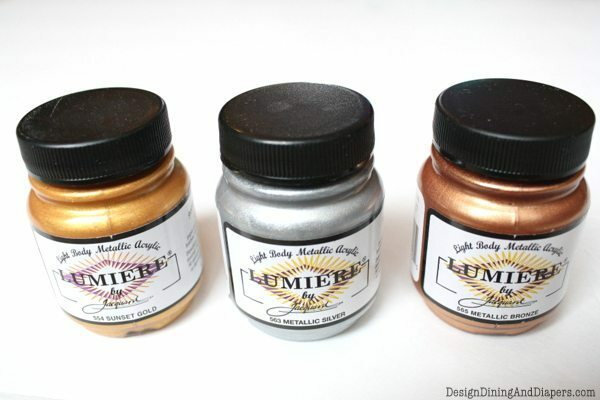 Their Lumiere Metallic Paints really stuck out to me and I have basically fallen in love with them. I decided to use some of the Lumiere Paints to make a set of Christmas Dish Towels and I am really happy with how they turned out. 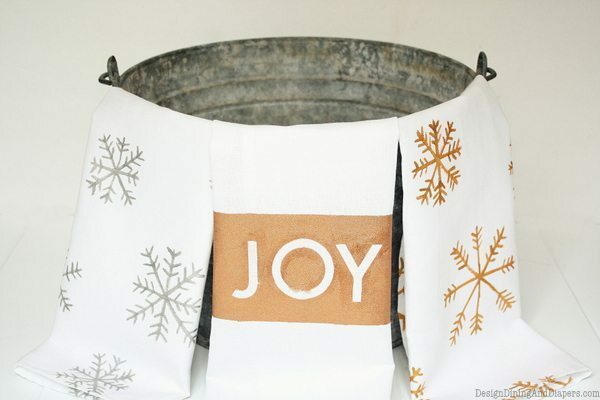 I used the Sunset Gold and Metallic Silver for the snow flakes and the Metallic Bronze for the JOY graphic. I chose to make my dish towels from scratch since I already had the white fabric lying around. My first step was to cut the fabric. My dish towels measure 16 1/2 X 28″ (unfinished). 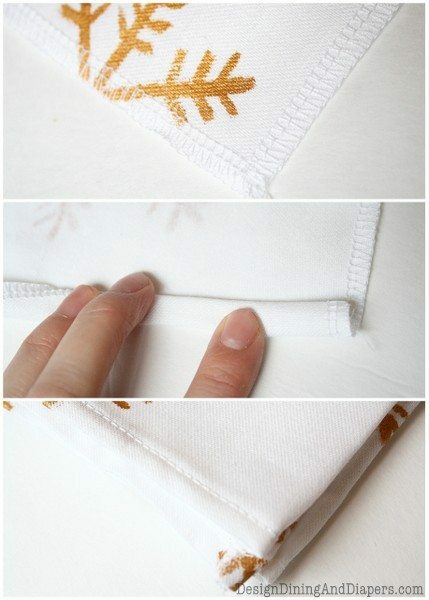 You could easily find plain white dish towels at the dollar store or kitchen store. The paints are designed to ‘go on like butter’ and they aren’t lying. 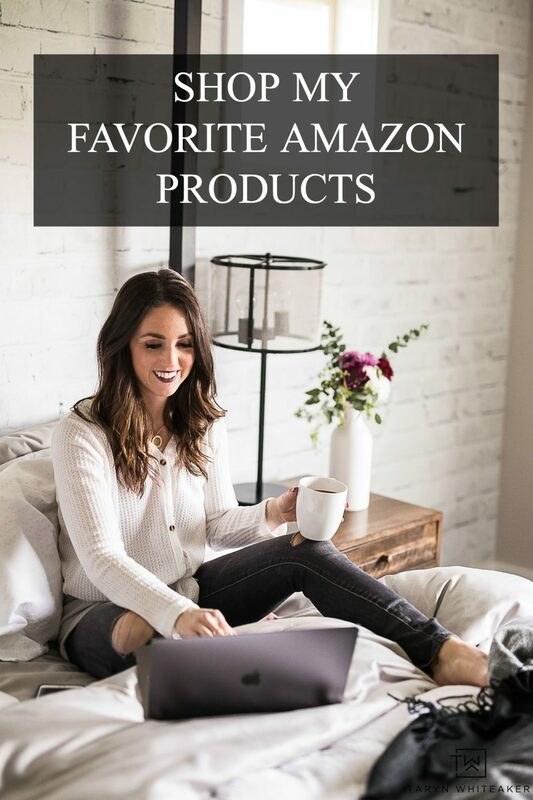 The paints are smooth and silky and they provide incredible coverage. I was seriously shocked with how well they brushed onto the fabric. Unlike other paints I’ve tried out, the Lumiere paints don’t absorb as much into the fabric so you aren’t wasting a lot of paint. They really just glide right over it. 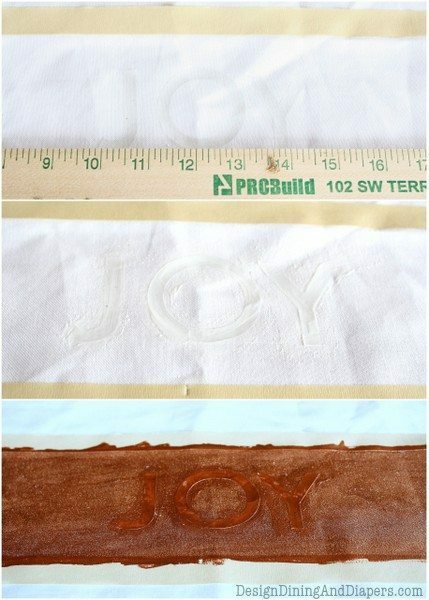 To create the JOY towel. I used masking tape (my preferred tape when painting fabric) to create my color block and then printed JOY letters using my Silhouette Cameo. I used a ruler to place my letters onto the fabric and then used a clear adhesive to make sure the stencils were secure to the fabric (I first saw this over at Making Home Base and I thought it was a brilliant idea since I always tend to get a few smears). I painted directly over the letters with the Metallic Bronze. I only needed one coat of the paint and it went on beautifully. After it was dry, I removed the tape and the letters. Because I made mine from scratch, I needed to finish the edges. So I used my serger to finish the edges, pressed the seam and finished it with a basic top-stitch. And if you are dying to try out some Jacquard Products too, you can enter to win a set of 32 gorgeous Powdered Pigments. Giveaway Post HERE. 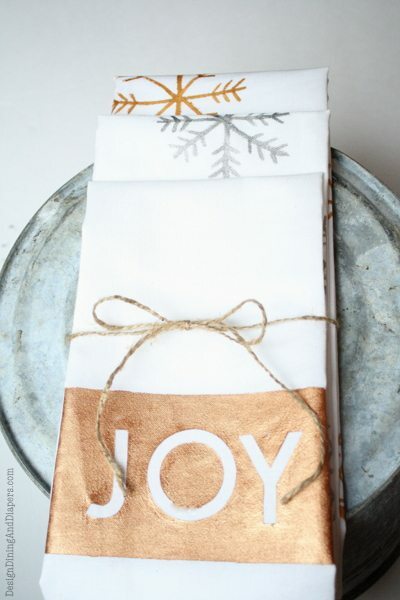 Soooo, who will be receiving your Hand Painted Christmas Dish Towels this year? Disclosure: Jacquard Products provided the paint for this project. All opinions are 100% my own. These are awesome – think I’ll just have to make some. Pinning it so I won’t forge this project. These are too cute Taryn!! Such a great gift idea too!! Very cute Taryn! I got some flour sack tea towels awhile ago and wanted to stencil them. I’ll have to check out the paint you used. Thanks for the inspiration! Taryn, everyone at my office is raving about these towels! They are so cute! Can’t wait to try this project! Wow these would make great holiday accents. This is ideal for large or small homes. The little things add a sweet touch to homes. I’d like to do some thing for Christmas…don’t know what yet. I can remember when sisters from the Jacquard company used to demonstrate their products on Carol Duvall and Aleene’s shows. Sure miss those programs. The jacquard products are excellent and they had beautiful projects on their website. I’ve had the Pearl Ex powders for awhile now but haven’t used them, not sure how to use them, but the powders are still very viable and ready to use. Glad I didn’t get rid of them. Maybe now I’ll finally get to work making some thing pretty, about time. I’m going to check out their website to see if they still offer such incredible projects. So pretty! I’ve never tried this paint before…now i want to! What a FABULOUS idea for Christmas gifts with a personal touch! I love ’em! Love these towels! Great christmas gift idea, thanks for the inspiration! Homa Style is having a Simple Holiday Gift Idea Link Party. 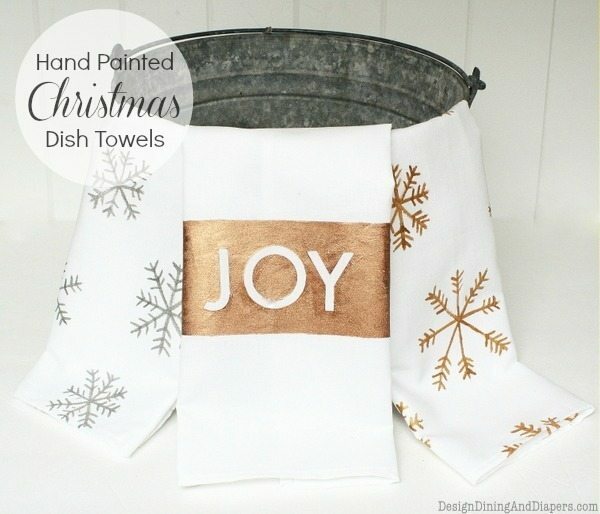 Your painted dish towels would be perfect as a holiday gift idea. These are awesome. I love the contrast of the white and the metallics. These are so beautiful! What a perfect idea for Christmas gifts. I almost bought their fabric paints a couple times, but wasn’t sure if it would truly make a difference (compared to other paint). I am definitely going to give it a try now! I am loving the metallic paint on the white towel!!! So does the paint dry soft? These are beautiful, found you at a linky party! Thanks for sharing! what pretty towels you made! I’m not generally a fan of metalics, but these are very nice! These are just gorgeous! Thank you for sharing at A Crafty Soiree! Thank you for joining Homa Style’s Simple Holiday Gift Idea Link Party. It’s hard to come up with new ideas for gifts and you helped with your beautiful painted towels. Thanks! Mark you calendar for the No Red Holiday Decor Link Party on Nov. 28. Plus the 12 Days of Christmas link party December 1st ~ 12th. Kind of hard to find the paint to buy. Love the towels.